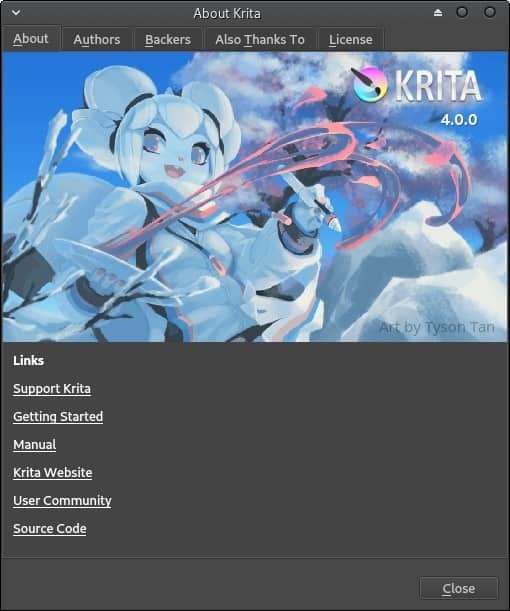 “There is an overlay for Gentoo with the latest version of Krita, maintained by a volunteer in the Krita community: "layman -a bloody && emerge --sync && emerge krita"
Also, Krita is available as an AppImage, and also as a Flatpak, so again, installation should be no issue. One of the main features in this new release, is support for SVG filetype vector images. Previously, Krita had been using ODG files, which are not very widely compatible, and made using Krita a bit of a pain if you had intention of working with Inkscape as well. I found Krita 4 to be pretty awesome to work with actually, in conjunction with a new drawing tablet I got as a gift from a friend of mine. Part of the issue with why I haven’t used Krita in the past, is the lack of proper SVG support, and so bringing that forward now with version 4.0, I’ve enjoyed messing around a fair bit, and may actually consider Krita a contender for my art needs. It might just be placebo, but I did seem to notice Krita booting up faster, and overall functioning faster than I recall in the past, so that was positive to note as well. The addition of background saving, was also absolutely critical, as Krita had a very annoying system before that left it unusable while it autosaved. This was long overdue, and I am extremely happy it’s been changed. Now you: What are your thoughts on the new features? Will this entice you to use Krita more? Let us know in the comments! Ghacks needs you. You can find out how to support us here or support the site directly by becoming a Patreon. Thank you for being a Ghacks reader. The post Krita 4 released: digital painting program appeared first on gHacks Technology News.